THESE HAMPERSTANDS ARE CURRENTLY DISCONTINUED. PLEASE SEE OUR OTHER PRODUCT OFFERINGS. This laundry Hamper-Host holds soiled linens, diapers, sheets, towels, gowns and other goods inside. It opens with an optional foot pedal for hands-free, no-contact access and its lid snaps shut. Any odors are sealed inside to prevent their escape into the air. The Hamper-Host stand is available in two sizes that accepts either an 18″ or 25″ laundry bag. Choose from 17 standard colors. The Hamper-Host is top-loading, with an integral lid so that bag and contents are completely enclosed for maximum protection and to meet Joint Commission infection control guidelines. The spring controlled lid closes gently to avoid airborne contamination. A front door allows no-lift removal of the full bag. Once the bag is filled, the outer shell is rotated to open the door. The Hamper-Host can be easily cleaned and sanitized with hot water. Units are shipped fully assembled. Two 3″ wheels facilitate pushing or pulling. Manufactured of 100% polyethylene. 17 colors available: Red, Brite Yellow, Brilliant Orange, Jade Green, Honey Gold, Powder Blue, Metallic Silver, Pink, Wine, Cadet Blue, Royal Blue, Purple, Beige, Brown, Black, Lime Green, Forest Green. Since Hamper-Hosts are molded to your specific color selection and are not returnable, it is very important that you determine which size you need. #03H18 holds an 18″ diameter linen bag (30″ x 40″ flat measure) or holds a 44 gallon polybag. 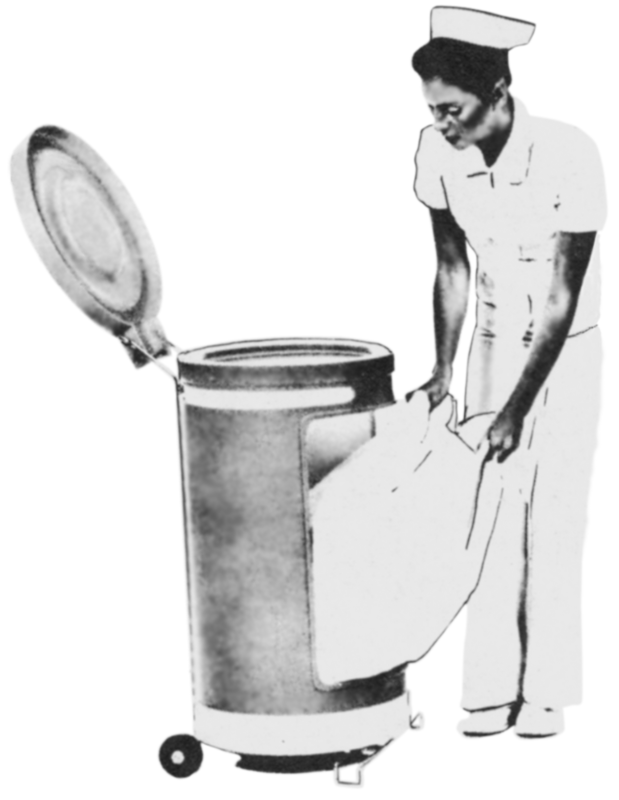 #04H25 holds a 25″ diameter linen bag (40″ x 40″ flat measure) or a 55 gallon polybag. NameHamper-Host Hamperstand For 18" BagsHamper-Host Hamperstand For 18" Bags With Foot PedalHamper-Host Hamperstand For 25" BagsHamper-Host Hamperstand For 25" Bags With Foot Pedal With / Without Foot PedalWithWithout For Laundry Bag Size18"25"